Is there anything more emblematic of Easter than marshmallow peeps? And yet, despite their popularity...does anyone actually like eating them? Okay, fine, I'll admit it: I love Peeps. They're fun, they're cute, and they're pure sugary, fluffy, tasty goodness. My favorite part of Peeps is that they practically give them away at stores the day after Easter, but that's beside the point. As fun as they are to look at, poke, and eat, they taste a lot better when you cook with them, as you can bring other flavors to the neon party. You can let your imagination run wild (Peeps sushi, anyone? ), but here are six of my favorite ways to cook with the Easter staple. Everybody loves Rice Krispies treats. Peeps are essentially just colored, sugar-coated marshmallows, which means you can treat them the same way you would any marshmallow. 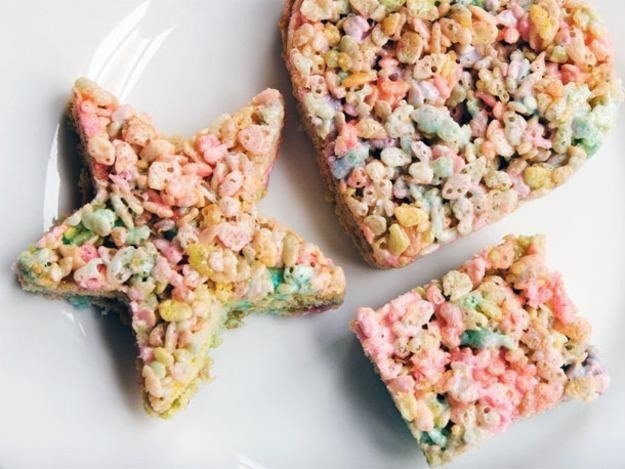 Melt them down with butter and add them to Rice Krispies and you'll get the same traditional childhood taste (albeit a little more sugary), but with the added bonus of some awesome and outrageous colors. 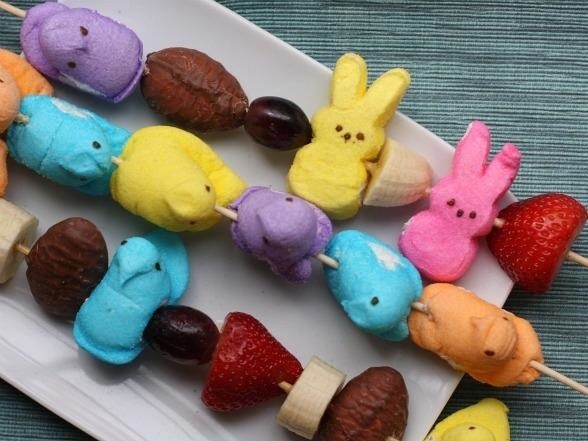 You could also go a step further and turn your Peeps fruit salad into Peeps fruit kabobs for a more visual and more fun presentation. 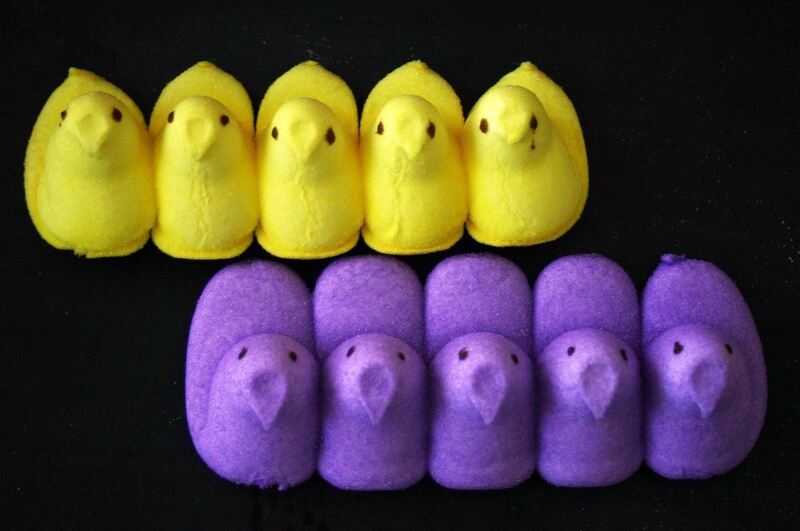 Peeps on Peeps on Peeps. 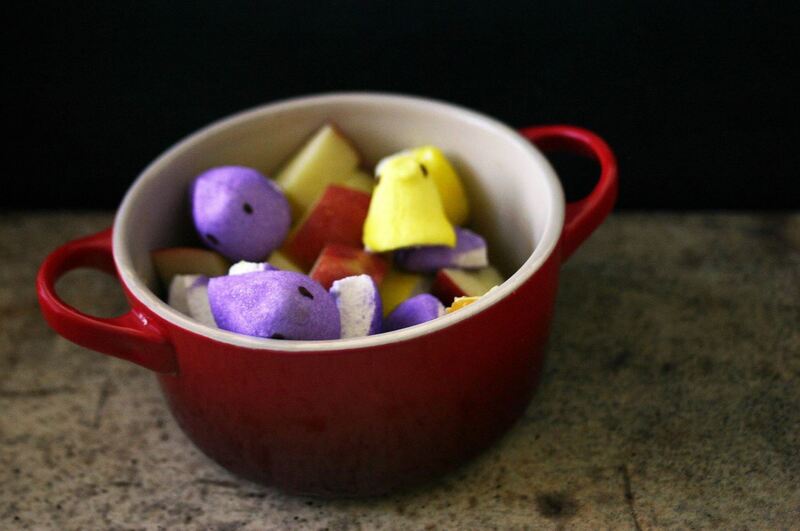 What's better than a regular-sized Peep? A large Peep! And what's better than a large Peep? A large Peep filled with regular-sized Peeps. Which, surprisingly, is a lot easier to accomplish than it sounds (though it's still a labor-intensive activity). A giant Peep cake filled with Peeps can be done by making a large cake in the shape of a Peep, hollowing it out from the bottom, stuffing it with marshmallow Peeps, and then decorating it. The result is beyond awesome, and will earn you instant "awesome parent" points if you break it out for a kid's birthday party. Easter comes at the perfect time, where you're transitioning from cold weather to hot weather, and from foods that warm you up to foods that cool you down. Peeps can help with that transition by becoming frozen chocolate pops. Start with a step that may make you feel a little uncomfortable: putting a popsicle stick into them. Then dunk them in chocolate, place 'em on a wax-paper lined baking sheet, and throw them in the freezer. Next time you need a frozen treat, you've got one. 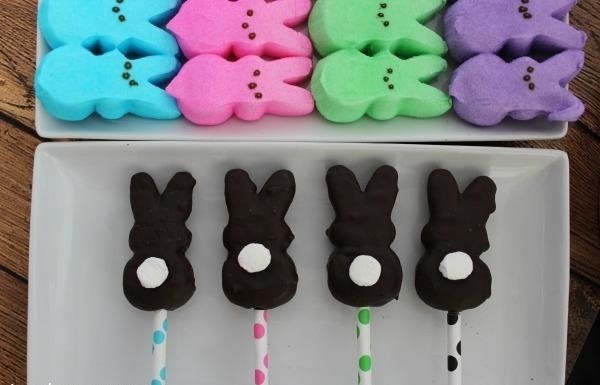 Check out the chocolate-covered bunny-shaped Peeps from Cincy Shopper. The colorful straws as handles are a nice touch. You can also cover them in caramel and eat them like caramel apples. What's not to like about that? 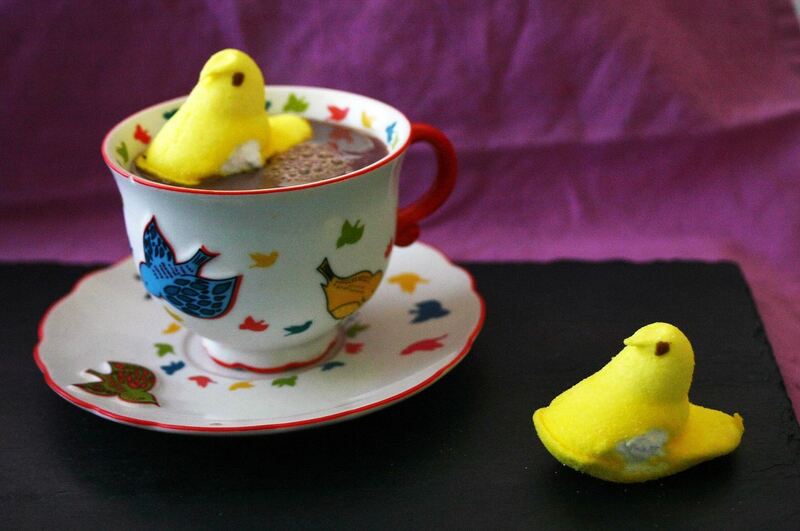 Just like their mini-marshmallow cousins, Peeps are excellent in a steaming mug of hot cocoa. And if you want to take it to a whole other level, make some Peeps s'mores to go with your hot chocolate. 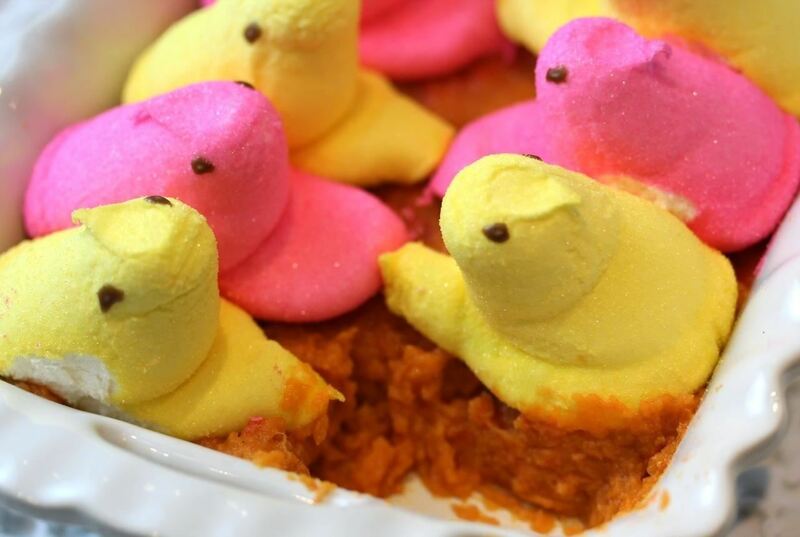 Amazingly enough, you can use Peeps in savory cooking. Marshmallow and sweet potato casseroles are a staple of Southern cuisine, and Peeps make for a colorful and exciting new twist on an old classic. Give someone a fun surprise for Easter (or April Fool's Day) by baking them cake inside real eggshells. Get crafty and learn how to make an origami Easter basket from one sheet of paper.